This theater uses no electronic aural or visual effects. Yet, Marley’s ghost was the most frightening specter I ever recall seeing on any stage. 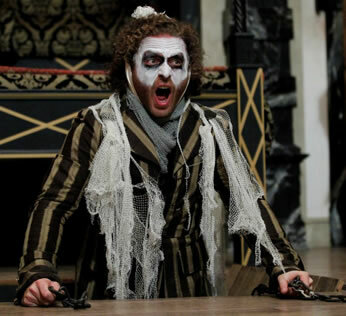 Jonathan Holtzman as Marley's Ghost emerges through the trap door of the Blackfriars Playhouse stage during A Christmas Carol. Accompanying Holtzman's chain-rattling and howling, other cast members below the stage howled, rattled chains, and banged on drums to create a creepy cacophony that made for a truly frightening specter. Photo by Tommy Thompson, American Shakespeare Center. The Blackfriars Playhouse has a lot going for it as an entertainment venue. It’s a warm, cozy theater, and because it has no differentiation in lighting between the seats and stage, and because people sit on the stage, audiences regularly become part of the action. ASC also tends to put a strong company on its boards, and this plus the audience interactions make for many “only at Blackfriars” moments. The theater is also supposed to be an educational venue as it tries to replicate the staging practices of Shakespeare’s own Blackfriars Theatre. Indeed, during the Renaissance season when the actors, with no director, mount plays from their parts and prompts in a week’s time, watching the Henry VI plays feels like you’re back in 1590 watching a brand-new play by the young upstart crow everybody was talking about. How ironic, then, that we got the most convincing experience in Shakespearean staging from Dickens’ A Christmas Carol. This theater uses no electronic aural or visual effects. Yet, Marley’s ghost was the most frightening specter I ever recall seeing on any stage. Start with Jonathan Holtzman as Marley, ghastly made up in whiteface and hollow eyes like Beetlejuice hung over and feeling mean. In a thundering baritone, he howled as he climbed through the trap door and rattled the chains dangling from his arms while, under the stage, other actors echoed his howls, rattled more chains, and pounded on a drum. No flickering lights, no smoke, no reverb, just three or four humans manually and vocally creating an effect that had children in the audience cowering and my own hair on end. Experiencing this makes one realize how effectively the Chamberlain’s and King’s Men could genuinely frighten audiences with Hamlet’s Ghost and create Ariel’s pageants. A company that so effectively juggles multimood Jacobean scripts deftly handled Dickens’ text with its rich drama, character-driven comedy, and idealistic schmaltz. John Harrell played Scrooge to the humorous hilt with a cynical bent and miserly affectations, but he was nevertheless a shy boy-man at Fezziwig’s party, pitiable when Belle left him, humbled at the Cratchits’ Christmas, and a boy-man, again, on the outside looking in on Fred’s party. Holtzman was not only a scary Marley, but as Ted—Ted? Who's Ted?—he even stole the scene of Fred’s party. But the two key casting decisions were Jake Mahler as Cratchit, who ranged from comic in Scrooge’s office to emotionally racked in his home, and Denice Burbach as Tim. These two and Kelley McKinnon (Mrs. Cratchit), Daniel Jimenez (Ben), Aidan O’Reilly (Peter), and Brandi Rhome (Martha), played the archaically melodramatic Cratchit family scenes with genuine care. Even Tim’s “God bless us every one” came off with conviction, all the more amazing as the almost diminutive Mahler had to carry Burbach on his back several times across the stage, each time engendering chuckles in the audience. But upon Tim’s death, when Bob Cratchit broke down, only sniffles emitted from the audience; the rest was the stilted silence of tears being held in check. That was the moment of Scrooge’s redemption, but he still had one more spirit to see. Given what we saw of Marley and that the first two spirits (Ginna Hoben as Past, Rick Blunt as Present) were both whimsical but yet foul-tempered and impatient with Scrooge, you just knew that Future (Dennis Henry, covered in shrouds like a Victorian corpse) would be the most discomforting yet. Kudos to a production that managed to keep us riveted to a story that’s so much a part of our collective conscience. René Thornton, Jr. gives an appropriately understated portrayal of Charles Dickens' archetypal character Ebenezer Scrooge in the American Shakespeare Center's production of A Christmas Carol at the Blackfriars Playhouse. 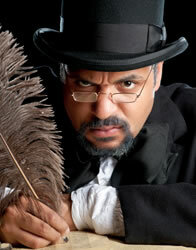 Photo by Michael Bailey, American Shakespeare Center. Except for Jake Mahler as Cratchit, Denice Mahler (nee, Burbach) as Tiny Tim, Ginna Hoben as the Spirit of Christmas Past and Rick Blunt as Christmas Present, this production has a whole new cast comprising members of the current ASC touring troupe (which includes the Mahlers and Blunt). As part of its tradition, the company casts one of its regulars in the lead role of Scrooge, and this year René Thornton Jr. got the humbugging part. Thornton has long been a reliable actor on the Blackfriars stage, but this year he has noticeably elevated his game, giving new dimensions to Hamlet's Ghost and Tamburlain's vanquished Emperor Bajazeth. He continued his soaring ways by giving Scrooge deeper dimensions, too. Is it really possible to bring anything new to Dickens' character? Thornton does, not only by making his Scrooge hit all his traditional marks, but making him seem immediately modern, too. In a mostly understated delivery of his lines (his Scrooge understandably goes batty on Christmas morning), Thornton gave Scrooge the natural and convincing demeanor we see in bitter businessmen or dour federal workers today. He softened ever so slightly as he watched the Christmases of his youth unfold, and in addition to the Cratchit family scenes inducing sniffles in the audience, this year's production unleashed the tear ducts when Scrooge humbly asked nephew Fred's pardon. As Fred (Daniel Abraham Stevens) hugged his uncle, we all simultaneously embraced old Scrooge. The Christmas redemption was as much ours as his.